Earlier this week during an interview at the D8 conference, Facebook CEO Mark Zuckerberg did the unthinkable: after finding the hotseat a little too toasty for his liking, he took off his hoodie. Interviewer Kara Swisher quickly discovered that the hoodie had a mysterious badge stitched on the inside and joked that Zuckerberg was in a cult. And then the Internet went sort of nuts. Tweets abound about Facebook’s Illuminati-like status. The folks at SFWeekly managed to recreate the diagram and did a thorough analysis on what it might mean. The Next Web declared that it was creepy. And back at Facebook HQ, three goats were sacrificed in an attempt to ward off yet another wave of bad press. Now, one Facebook employee has apparently tired of leading a life shrouded in secrecy — they’ve put their hoodie up for sale on eBay. It’s described as “the exact same” as the one Mark Zuckerberg wore to the conference. And while it’s unclear whether the hoodie alone is enough to gain official entrance into Facebook’s cult (you may have to go through an interview or two), it’s probably enough to blend in at the weekly midnight bonfires. Don’t be surprised if other enterprising cult members decide to sell off their hoodies in the near future to capitalize on the public’s increased awareness. Oh, and 15% of the proceeds of this sale are apparently being donated to the EFF. 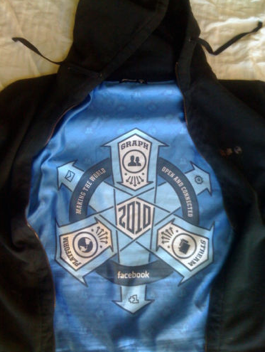 This is a limited edition, employee only, Facebook hoodie. The same exact one worn by Mark Zuckerberg at the D8 Conference. Buyer pays shipping. Will ship within 24 hours of winning the auction. Ships from San Francisco, CA. No pick-ups/drop-offs. Update: Wow. Bidding has crossed $1000. You people do realize that this is just a hoodie right? And that there isn’t actually a cult? 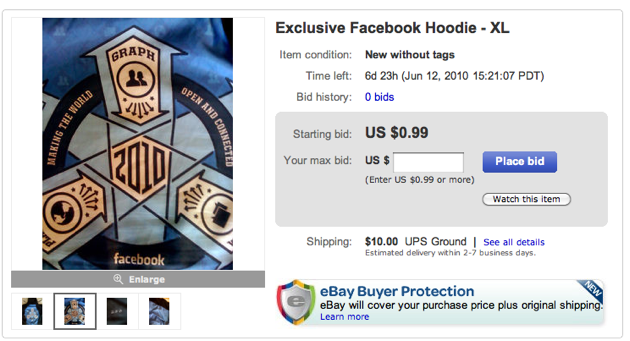 Update 2: There’s now a second Facebook employee hoodie on eBay. And this one comes with matching sweat pants. Bidding starts at $150.